Ah, the family road trip. There’s nothing like an 8 hour car ride to get your family vacation started on the right (or wrong) foot! If your adventuring family is anything like ours (ie you don’t have an unlimited supply of cash, frequent flyer miles, or world-class destinations in your backyard) you are probably racking up more mileage on your bumper-sticker laden SUV than you’d like to admit. And all that mileage adds up to a lot of hours in the car together…very close together, maybe even touching, since your tent, camp stove, and backpacks are taking up the majority of the backseat. So how do you make all those long cramped, hours in the car manageable? The following items won’t get you there any sooner, but hopefully will help the time fly by faster. While ordinarily our family tries to minimize our TV time by maximizing our outdoor time, road trips are a rare exception. A long car ride is the one time that our son is allowed to watch TV for hours on end. 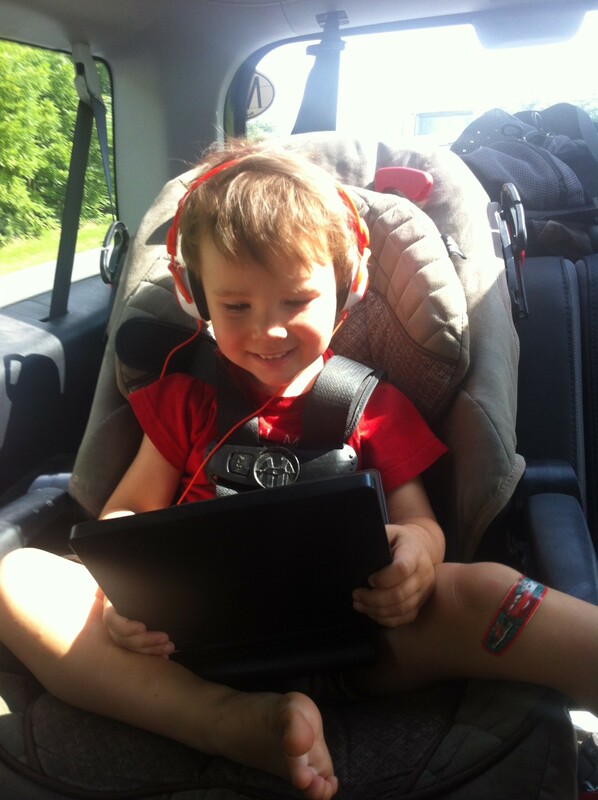 Therefore, he’s the first to start packing when we say the words “road trip!” There are a wide range of sizes, specs, and prices to choose from, but a portable DVD player with a 7-9 inch screen should fit perfectly in a child’s lap. One essential feature to look for is a power adapter for the car, allowing the player to stay fully charged even on long trips. This piece of gear goes hand in hand with the previous one, because after the 5th round of Thomas the Train, you’ll be thankful you bought these! And for families with multiple kiddos, headphones are a great way to keep the peace when musical tastes vary. These headphones may be designed for little ears, but they boast the same high quality components found in most standard adult headphones. A built-in volume control knob featuring the proprietary KidzControl Volume Limit Technology is a comforting safety spec for new users! When your kids need a break from their handheld gaming devices, take this oldie-but-goodie out for some educational family fun! This is not your grandma’s license plate game. Well, actually it is…just wrapped up in a sturdy, colorful, reusable package! 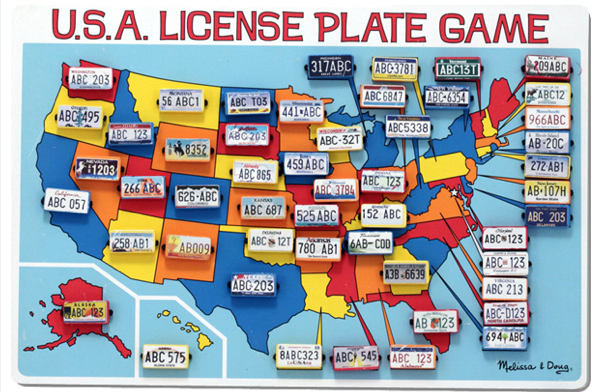 Kids of all ages will enjoy scanning the roads searching for more license plates to flip over – and the best part is that there are no loose pieces to keep track of when you’re all done! 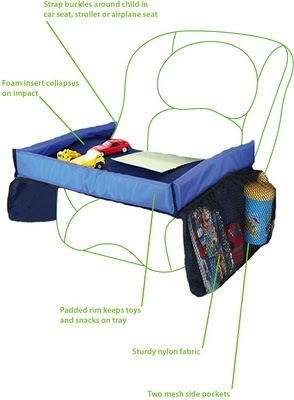 Do you ever wish your child had a table top built into their car seat for snacks, writing, drawing, or even reading? Your budding artist will have a perfectly flat space in which to color with the Star Kids Snack n Play, and other riders won’t have to constantly pick up rolling crayons! 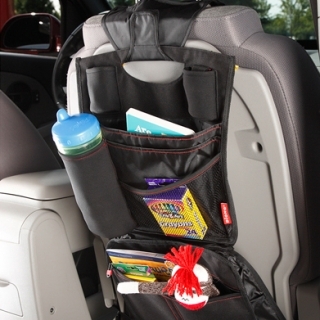 Secured by straps that buckle around your child’s car seat, this brilliant product also features two side mesh pockets – perfect for storing a host of entertainment options! DIONO CAR ORGANIZERS: If your family is anything like ours, car clutter can easily get out of control…especially on family vacations! Luckily, Diono offers several mess-free storage options that will keep everything you and your child needs on the road at your fingertips. Our family was lucky enough to try two – the Baby Organizer and Stow ‘n Go. 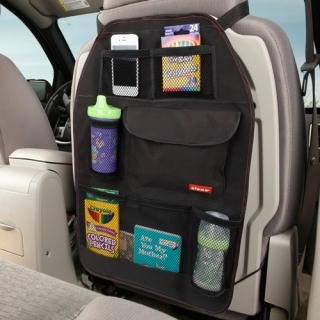 Both provide an array of mesh and zippered pockets, and both fit securely to the back of the passenger seat. The Baby Organizer is a little more versatile – it can conveniently zip together to carry as a bag, as well as attach to a stroller. 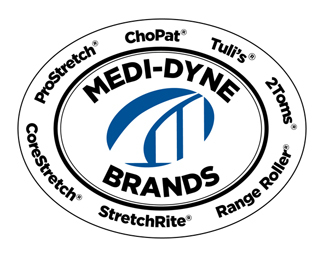 But both products get the thumbs up from us! We do several 6+hr road trips per year and typically one over 12hrs. Having a notebook and crayons gives the kids tons of entertainment and bringing along a music maker toy to let them play along to the radio keeps them happy, you just have to be tone deaf! Those organizers look like a great solution for our yearly road trips to Canada! I like both pages on FB too! We’d love to win one! We always play “let’s find a…” and there person who finds that thing gets the next turn. Keeps my little one occupied for hours looking outside! The munchie mug! A total must have to keep the cheerios IN the bowl for self-feeding-toddlers. And we really like camelbak sippy cups with the flip top, absolutely spill proof for milk and water. Great ideas on your post. I like the travel organizers! 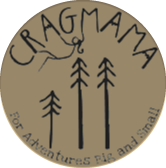 (Liked Cragmama and Diono pages). Cheers! 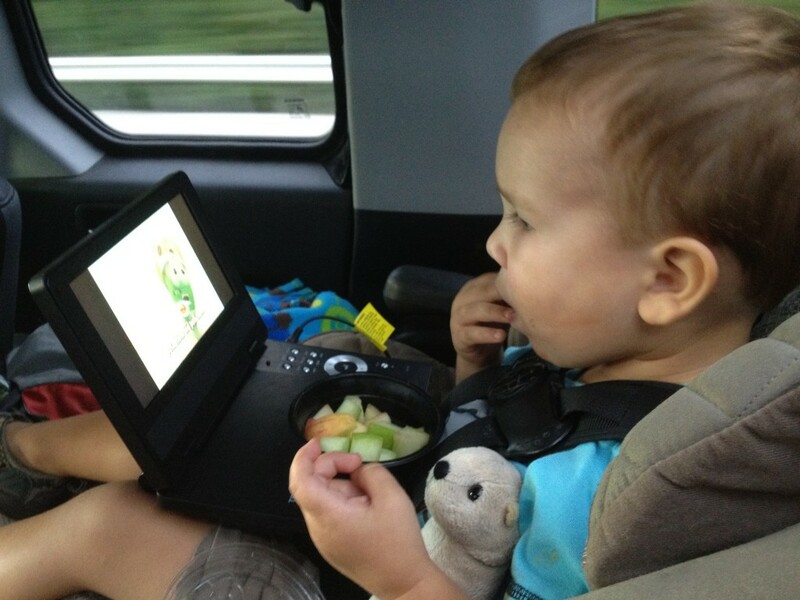 Aside from snacks and drinks, our travel essentials include an iPad for cartoons and games. A few smaller easily packable toys and books seems to have also kept our kiddo happy in the past. I am thinking about adding a coloring book and crayons to the mix. Hopefully all these tricks will still work! My only advice that I would throw out there with traveling is, if possible when flying, we try to pick and evening flight to encourage sleeping. Since we mostly fly to Colorado we pick the last direct flight out of our hometown to CO at the near bedtime hours for our little one and that seems to help us. Not sure it works for everyone but it does seem to help us! We play classic road trip games! When the kids get older, check out letterboxing. It’s been a great way for our family to break up long trips by car. We go on lots of long road trips and snacks are totally essential! My kids also really like music and audiobooks. We always bring a windshield reflector on any summer trip. Helps make getting in the car a little easier when it’s hot out. Also, another tip for cooling hot cars is opening two opposite doors asap to get a cross-breeze! Fortunately our family lives close enough that we can drive, but far enough that it’s a little hard on the kiddos. We try to go at night, at least partly, so they can sleep and be ready to play in the morning. It also makes for fewer potty stops when they are sleeping. I also try to take the training potty along since they are still small enough that they fit the potty but not big enough to hold it to the next stop. Luke – I like the music maker toy idea! Addy – The “Let’s Find a….” is another great idea. We do that in restaurants a lot too! Laurissa – It’s amazing how much entertainment a bowl of Cheerios can provide, especially for the younger toddler set! Amy and Betsy – Naptime/bedtime are definitely the most peaceful driving scenarios! 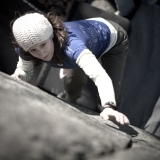 John – I had to google letterboxing, since I’d actually never heard the term before. Definitely looks like good (and educational) entertainment for older children, thanks for sharing the idea! Diana – Amen to snacks. Sarah – The windshield reflector is definitely a good idea, especially if you make a lot of stops where the car is turned off and starts baking. I buy a few new (cheap) toys/books to surprise my daughter with on the trip. Makes a great reward for a well behaved girl 🙂 Also, I always download a new movie and game app on the ipad. My best tip is to be over prepared. I travel alone a lot this summer with my 2 and 3yo boys while hubby was working and I found that if I had more than enough snacks, more than enough games/movies, and a bunch of toys for them to play with (coloring, a few blocks, etc) that the ride went smoother. My 2yo would sleep most of the time and my 3yo would play by himself. If my 3yo was not entertained, he would wake the 2yo and it was all down hill from there. Before a road trip I stock up on a few small toys or crafty items that won’t make a mess in the car. The greatest “toy” on our last trip was a package of pipe cleaners. My daughter spent hours bending them into all kinds of things. By the time we got to our destination she had made herself a bracelet, a necklace, and eyeglasses. Lol. Even my husband got into and took requests from it younger daughter for butterflies, flowers, etc. Cheap and entertaining! Lots of snacks and surprise/new toys! And I like both on Facebook!! My girls (5 & 2) love mini characters, whether they are Disney, fairies or dinosaurs, they can play for hours with them. Coloring/drawing is another big road trip must for us. My oldest loves to play eye spy and her own version of 20 questions and her sister is slowly beginning to play these as well. We took a cross country trip last year (CT – CO), and the “Road Trip Fairy” stopped by every so often and dropped off new little trinkets to occupy the time in the car. The dollar store was great for these things. From pipe cleaners, more mini character, matchbox cars and of course more crayons and paper! At the end of the trip the fairy left a special gift for being such great travelers! Always have wetwipes and extra diapers handy. Take lots of breaks on long road trips and bring a ball to throw around. P.S. I gave Diono and Cragmama a like on facebook. Thanks! We take a lot of snacks and movies. We also keep a magma doodle for drawing. Would love to be a winner! Taking our ipad is a must. We are in the car every week going to and from the doctor for my son. Headphones are on my must have list now! Liking both pages on facebook! 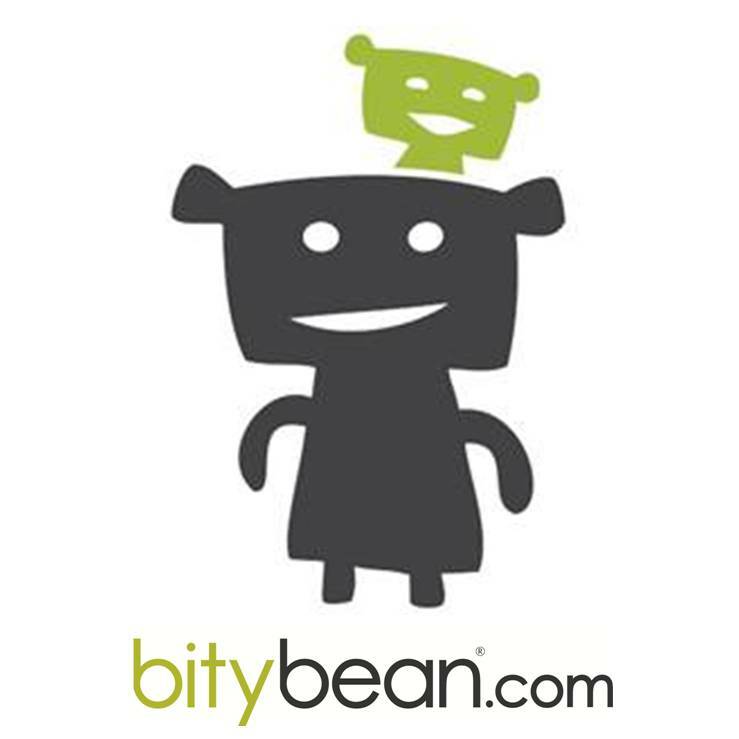 Amy K – We don’t have an iPad, but I’m all about adding educational apps to my iPhone! Keri – With toddlers, I don’t think you can ever be TOO prepared 🙂 Good on you for doing so much traveling with 2 young ones! Andrea – It’s amazing how creative kids can be, isn’t it! 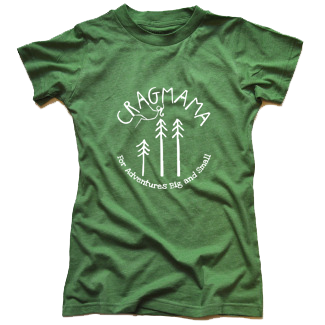 Jenny – The Magma Doodle sounds cool – might have to put it on C’s wish list! Elyssa – I’d never heard the lemon drop trick, I’ll have to try it next time we’re winding through those horrible mountain roads at night! Mi – Even though we’re out of the diaper stage, we still can’t seem to ever have enough wet wipes! And thanks to all for the extra facebook likes! We always did things similar to the license plate game as kids. I have 2 kids and most of our travel is through the prairies in Canada, so we sometimes have contests for who spots cows or horses etc first. When it’s dark out, the kids like to make up their own constellation names in the stars. Your little guy is very cute, perhaps a piece on car seat safety would be a great addition to summer tips. Things like adjusting the harness to the right height (straps should be at or above the shoulders where they come out of the seat for a forward-facing child,) and tightening the harness are just as important as finding activities to keep our little ones busy. Thanks for the ideas and happy travels. Trudy – I was always a fan of the cows/horses game myself growing up whenever road trips involved lots of farm country. As far as the carseat goes, the straps are incorrect as pictured and I realize that now (after being berated and attacked publicly on the internet). Thank you for sharing your knowledge in a kind and encouraging way rather than making judgmental assumptions. Mostly following for ideas since my little man is only 7 months and can’t play long by himself. But we definitely bring his favorite car toys and try to time a nap into the drive.